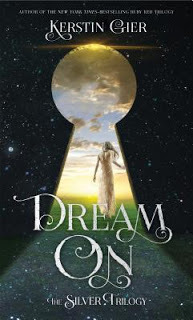 This week, my swoon is from Dream On by Kerstin Gier! ... Grayson, Florence, and Lottie. And someone with bright-gray eyes and dark-blond hair standing out in all directions. I almost burst into tears of sheer relief. He simply pushed Emily aside and took me in his arms. "Hey, there are you are again, my cheese girl," he murmured into my hair. "I've missed you so much." I wound my arms around Henry's neck and held him much closer than was strictly necessary. "You smell nice," I whispered. It wasn't precisely what I wanted to say, but it was the first thing to come into my head. Great cover. I sometimes reread a book when I get the next in the series if it has been a while. Happy reading. This is super sweet. This is my idea of romance! I might be adding yet another book to my TBR pile.